Stephanie Kwolek was an organic chemist, best known for inventing Kevlar in 1965. Kevlar is an immensely strong plastic, first used as a replacement for steel reinforcing strips in racing car tires, and now used in a large number of applications where high strength is required without high weight. 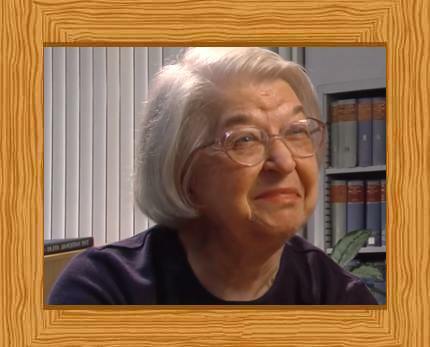 Stephanie Louise Kwolek was born in 1923 in Pittsburgh, Pennsylvania, USA. Her father died when she was only 10 years old, but he passed on his interest in science, particularly natural science to his daughter. Age 23, Kwolek graduated with a degree in chemistry from Margaret Morrison Carnegie College of Carnegie Mellon University. She was quickly recruited to work as a chemist at Dupont Chemicals in Buffalo, NY. Four years later, she moved to Wilmington, Delaware where she spent the remainder of her career with DuPont. After nine years of research work, Kwolek made her major breakthrough, discovering Kevlar. Her pathway to discovery began a year earlier, when she began looking for a new, lightweight plastic to be used in car tires. The idea was that lighter tires would allow vehicles to enjoy better fuel economy. Not only did Kevlar find use in tires, its combination of lightness and strength has seen it used in a large variety of protective clothing applications, such as bulletproof vests, which have saved the lives of countless police officers and other people. Stephanie Kwolek died on June 18, 2014, at the age of 90. Stephanie Louise Kwolek was awarded the National Medal of Technology; the Perkin Medal, which is seen as the highest award in American industrial chemistry; the Chemical Pioneer Award of the American Institute of Chemists; and the Howard N. Potts Medal for Engineering. In 1994, she was admitted to the National Inventors Hall of Fame. Today, Kevlar is used in a great number of different ways, including armor, gloves, tires, yacht sails, shoes, ropes, and tennis racquet strings. Kevlar is an example of a type of chemicals called polymers. Polymers are long molecules, which are made by joining smaller molecules together into a chain. The chemical reaction Stephanie Kwolek discovered that makes Kevlar. The chemicals on the left are reacted together to form a larger molecule on the right. 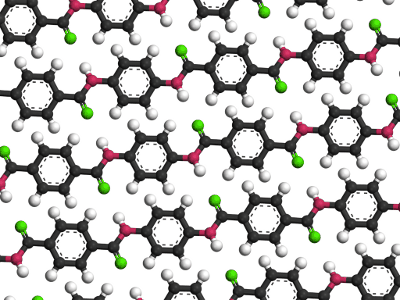 The larger molecule is Kevlar. The chain within the square brackets is called the repeat unit. The chain can be grown to different lengths, with more or fewer repeat units in the chain depending on the precise reaction conditions. Different reaction conditions allow the manufacture of Kevlar to be fine-tuned depending on its desired end use, resulting in a variety of different Kevlar grades for purchase. In precise chemical terms, 1,4-phenylene-diamine reacts with terephthaloyl chloride in a condensation polymerization producing Kevlar and eliminating hydrogen chloride. The raw Kevlar polymer is spun to produce very strong, stiff fibers. When this was first done, Kwolek was astonished when she discovered that weight-for-weight the polymer she had made was five times stronger than steel. The strength of Kevlar comes from the very strongly bonded, stiff polymer chains shown in the molecular diagram above. Each long chain is bonded to neighboring chains by hydrogen bonding. "Stephanie Kwolek." Famous Scientists. famousscientists.org. 21 Jun. 2014. Web.